Thank you for your kind words, We love sharing our Magical horses! Their horses were beautiful and very calm. Their carriage was in great condition - we went with the Cinderella Carriage and the Indian dressed horse for the Bharaat. The service from the moment of contracting to the day of the wedding was excellent. They were prompt with their responses and very accommodating. We had a lot of last second changes and they made them all happen with a smile on their face. Would work with Heather and the team again and recommend them to everyone! Thank you! Thank you! We loved being a part of this magical day! So many talented professional and the photos are the proof in the pudding! they are stunning! Heather was so sweet from the beginning. She made sure to have every detail! I was surprised that they showed up early and stayed for pictures after the ceremony! We highly recommend wind chase farm to anyone, the carriage was just beautiful and the horses were WELL trained and stunning!! Thank you Kristin, we are so happy we could help make your day even more memorable! We wish you all the very best! Magical!! Love this company year after year! Thank you! We love being a part of your Celebrations every year! So many happy faces! We look forward to working with you again next season! Your wonderful horse and carriage transported Santa and Mrs. Clause through the parade and was magical. Thank you so much! Thank you! 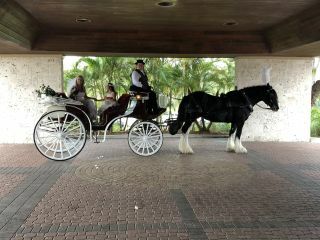 It was our pleasure to provide a magical horse-drawn carriage entrance for such VIPS ! We appreciate your review! Heather and her team are super responsive and always were able to adapt and change to what my event needed. The Cinderella Carriage is absolutely magical and had plenty of space for 6 people at one time. Thank you for having Wind Chase Farm as a part of your special Event! We appreciate your kind words and look forward to being a part of next years celebrations! Wind Chase was beyond amazing for our wedding. We thought a horse and carriage would be a great way to exit and we were totally right. 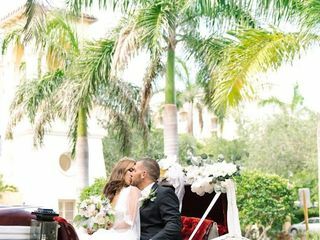 Our guests were blown away by the beautifully decorated carriage and horses which were even decorated in our wedding colors. The staff were very pleasant and very accommodating despite the strict rules set by the venue we had chosen. The horses were extremely friendly and well behaved. I would definitely recommend this place for anyone looking to add that extra special ending to their wedding! It was our pleasure to be a part of your Wedding Celebrations! We can't wait to see those professional photos! Thank you so very much, We enjoyed the festivities and music indeed! Our horses are extremely well trained for the drums and music and dancing! Our Pleasure we look forward to celebrating with you again! Heather and her team we’re PHENOMENAL, they very prompt, very professional and was always available to answer questions I had. I can’t speak for everyone but they are definitely my go to the next time I am looking for their type of service. Thank you! It was our pleasure and we look forward to working with you again! Thank you so much! It was our pleasure to be a part of your wonderful Celebration! Congratulations! Yes it was! and we were thrilled to be a part of your BIG day! Has the Cinderella carriage for my wedding 10.14.17 that was decorated very nicely. Everyone was so professional. Thank you for your review! Our years of carriage driving experience and professionalism always shine through! Glad we could be a part of your Celebration! Amazing ♥️. They were very accommodating and professional. Wind chase helped to make my daughters day wonderful! We have been so happy with quality and service of Wind Chase Farm carriages. We have used their Cinderella Carriage 2 years in a row for a production. Both years they were easy to work with. The carriage is beautiful, they took care of the delivery and set up, and they communicate very well! We will use them again for sure! Thank you for your 5 star review its always a pleasure and we can't wait to see those photos! Heather was so helpful! She was knowledgable, easy to communicate and plan with, right on time! Our event was very memorable thanks to her and the beautiful white horse! Over the top! It was the highlight of our wedding! Heather was so wonderful to work with! I did not think I wanted to spend the money for this but am 100% happy that I did. I felt like a Queen! Everyone was in awe of this. I would keep it a total secret to EVERYONE and surprise your husband and guest with the horses and carriage. The pictures are amazing!!! I am so very pleased with everything. I could not be happier. The best decision other than saying yes and I do!!! This is a MUST!!! We were so thrilled the day you decided to go with it! We had so much fun keeping your secret! and those photos.....well just amazing! We wish you both your Happily Ever After! We had a wonderful experience with Wind Chase Farms. Heather was very responsive and always kept us up to date on our event. The horses, Court and Patrick were beautiful and very well mannered. I would highly recommend their services. 5 Star service all the way! Thank you! We take great pride in our Horses, Carriages and Gold Medal Services! Wind Chase did an awesome job at making my daughter's wedding day special with their timely manner, professionalism, and beautiful horses. We would highly recommend them to anyone. Thank you for your kind words we were thrilled to be a part of your Celebrations with Family and Friends! Wind Chase was great from beginning to end for our special day!! Thank you so much for including us in your Wedding Celebration. We are so appreciative of your 5 star review! We wish you all Happiness in your new life together! 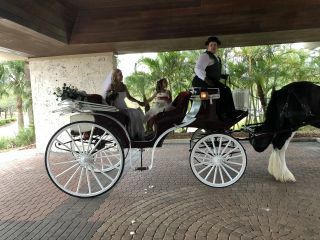 Where do I begin on how happy I am on how beautiful the carriage was and the horse, it made my daughters wedding just perfect. Heather listened and understood exactly what I wanted. It was a surprise and the bride was ecstatic, it made her wedding do that no one will forget it. I will recommend them to everyone I meet! Thank you Debra and we were thrilled to be a part of the surprise! We take great pride in all of our turnouts. thank you for your 5 star review! 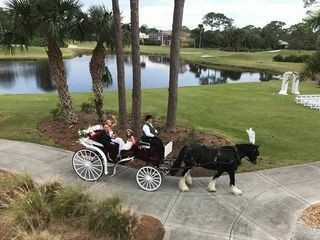 Arriving at my ceremony by horse and carriage took the breath away from my guests and husband because it was so beautiful. The grand Clydesdale horse and the carriage were dressed in flowers and ribbons to match my wedding colors. The owner of the company was my coach woman and she was in a top hat and looked as if she were playing a part in a movie. I was taken through downtown stuart before the ceremony where the entire town gave me standing ovations and clapped. Using this service truly made me feel like a princess on my special day. I hope every woman feels this special when they get married. Everyone in my wedding was living a magical day!!! It wouldn't have happen if I didn't have the horse and Carriage!!! It was magical !! We really live the moment !! Thank you Janet! 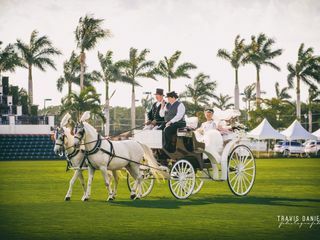 We were so thrilled to be a part of your BIG day with our white carriage horses and Cinderella Carriage ! We can't wait to see these professional photos! Congratulations! We enjoyed every minute of it! We wish you both the best and thank you for your 5 star review!